Castle Berze-le-Chatel is an attractive medieval manor, which formerly was known as Barzil. 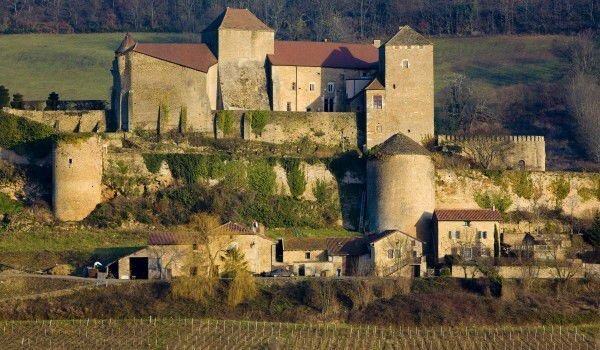 Berze-le-Chatel dominates the front of the rock Solutri and the picturesque landscape and beautiful vineyards of the Lamartinian valley. This region is known as South Burgundy, which occupies an area of southern France. Thanks to the grapes being grown near Berze-le-Chatel, France has the glory of one of the best wine producing comprehensive resources. Castle Berze-le-Chatel was built between 13th and 15th century, around the Carolingian Chapel. Its construction is solid - it has three surrounding walls that surround the pleasant rooms retain the spirit of past centuries, and several different scenic gardens. In Berze-le-Chatel is a beautiful fruit, vegetable and formal garden. Indeed, the defensive structure of the palace are quite serious. Its defensive wall follows the natural curves of hills and there are 13 watchtowers once used for preventive defense measures of Berze-le-Chatel. By design Berze-le-Chatel no traces of Renaissance architectural influences. This is mainly due to the fact that the castle during the greater part of its history was an army fort in the 16th century. After this period the castle was abandoned for nearly two centuries during which iteventually sank into ruins. And today, if the weather is nice and sunny panorama Berze-le-Chatel may seem very gray and scary. An intervening sun, however, flush the fortress in nice yellow tones and nothing to remind you that it was once a military headquarters. In 1817 Berze-le-Chatel again passed into the hands of the Counts Thy de Milly. Thanks to them the castle Berze-le-Chatel turns into a beautiful residence. The family took on major repairs and renewed and expanded windows and major parts of the castle. There is not much left of the beautiful gardens, all that is visible today, is that the park and plantations have been maintained and enriched over the years by experienced gardeners. Today the castle Berze-le-Chatel is open for public visits on a small entrance fee. In addition to standard historical tour in Chateau also offers a view of the wineries. There is an opportunity to buy wine produced in the palace.